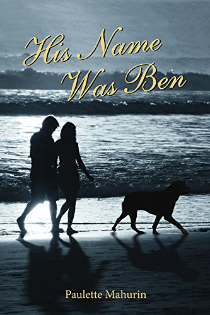 In His Name was Ben: A Novel by Paulette Mahurin, Sara Phillips’ life changed when she received a cancer diagnosis. Life was over until she met Ben and everything changed yet again. I received a copy of this novel from the author in exchange for my review. Most of us will have lost someone to cancer. The aforementioned Allison Doan is only one of the people with whom I’m acquainted with who lost the battle. Cancer is a brutal adversary and one that is an incredibly emotional topic for readers. Both of the main characters in His Name was Ben have cancer and neither have much hope of survival. Mahurin doesn’t sugar coat the struggle. When Sara meets Ben in the oncologist’s office she has Stage four breast cancer and while facing her own mortality is also facing an emotional internal battle involving her own desirability. Based on a real-life event, Ben and Sara meet when he has a low chance of survival and she’s starting an experimental treatment that gives her some hope of survival. She’s afraid and ashamed of her condition. Her emotions are raw and real. Her attraction to Ben is instant and she takes a chance and gets his contact information but the next move is complicated. Together they’re able to build a friendship and a sense of companionship as well as a romance. It goes without saying that any story with a dog is a better read and His Name was Ben has an adorable mini-rottweiler. I’ve said in prior reviews that Mahurin’s writing style is simple and direct. In the case of His Name was Ben, the device works for maximum impact. The subject matter is emotionally draining and the slight disconnect of the author’s style helps the reader absorb the magnitude of what the protagonists face and the inevitability of a connection and benefit of support each provides the other. Both protagonists have issues outside of their end of life diagnosis. If you have a family with a lot of problems, they’re not suddenly going to stop having problems just because you’re nearing the end. Mahurin is a careful author whose technical execution is flawless. She is an author who truly seems to find a connection with her work and the story flows so that readers are immersed. This reader found herself really thinking about what she would do in the position of the main characters. They are in an impossible position and while I hope to never know their struggle, it reads as wholly authentic. Mahurin’s work is of a consistently high quality, but if you’re looking for a good read that will really tear at your soul, pick His Name was Ben up today. The Persecution of Mildred Dunlap made it on the Indietribe top ten list in June 2014. You can read our review here. To read the interview with Paulette Mahurin and Rabid Reader’s Reviews, click here. For more information about Paulette Mahurin and her work, visit her website. You can connect with her on Goodreads, Facebook and Twitter @MahurinPaulette.